You’ve played through your current set of guitar strings. Over time, they’ve picked up sweat and dirt from your hands and your surroundings. It’s time for a change. What next? You’ll need to choose another set of strings with a suitable string gauge correlating to your instrument, your style of music and the way you play. Picking out a set of guitar strings is simple when you know what you’re looking for. Until then, all the various string gauge combinations and brands can lead you down a deep rabbit hole. String gauge is the thickness/diameter of a guitar string. It’s measured in 1/1000th of an inch. For example, a 10-gauge string is 0.010 inches. Guitar string packs are usually referred to by their thinnest string, e.g. 10s. Strings are commonly made of stainless steel, nickel, cobalt or copper. Thicker strings provide more bass, thinner strings produce more treble. Guitar strings obviously have a very thin diameter, so require a digestible measurement for the regular player to understand what they’re buying. The smaller the number, the thinner the string. The higher the number, the thicker it is. For example, a .008 string is extremely light and would generally be used for the thinnest string on an electric guitar. A .056 is very thick and would be the thickest on a six-string. Lots of companies refer to their string packs by the thinnest string. The most common packs you’ll encounter are 9s, 10s and 11s. Some brands give general names to their packs like light, medium, or thick, respectively. However, different brands will vary the thickness of equivalent strings. You might see Ernie Ball make a set almost identical to D’Addario, but one pack’s third thinnest string is .018, while the other’s is .016. That is why it’s important to understand what you’re buying and what’s changing when you buy a new set. Notice how the first set is thinner across every string than the first. That means, in general, they’ll be easier to play for many beginner guitarists because they require less finger strength. They don’t require as much force but do require more accuracy. Thicker strings certainly help build up both picking strength and endurance in your fretting hand. As you become a better player, you’ll notice how much more effort you have to put into fretting and picking in comparison to a thinner set. Thick strings are great for rock and metal music which require fatter tones and incorporate drop tunings. They fit the popular musical attributes of the genres. Thinner strings are easier to bend, pick, perform legato and arpeggios and to add flavour to your playing. The downside is they don’t sound quite as chunky or produce as much power as their thicker equivalents, especially on the lower-tuned strings. There are ways to get around this with hybrid packs, which we’ll get onto. It’s worth stating that string gauge is extremely subjective and you could potentially use almost any gauge for any genre. However, there are some general guidelines you can follow if you wish to create the associated sound with a particular musical style. Country and folk music often involves a lot of finger picking. Thinner strings provide better clarity and speed for the picking hand. Pop music suits lighter strings, too, as the sound is more focused on higher middle and treble frequencies than they are bass. Blues styles favour a lot of string bending. This is easiest to achieve using thinner strings. The thicker a string is, the more tension it holds. Light strings take less effort to bend. Popular guitarists such as Stevie Ray Vaughan, however, favoured thick strings to get warmer tone. Contemporary jazz guitar usually involves a lot of technical, fast playing and advanced techniques. 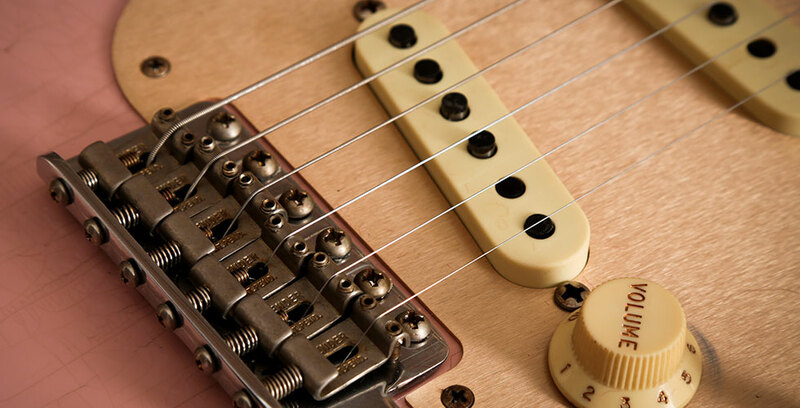 A thin string gauge is ideal because you don’t have to put as much effort into fretting. Great if you’re playing lots of notes in quick succession. Medium string gauges are a versatile pick for almost any genre. Great for rock and blues, as you can dig in and get chunky sounds out the low tuned strings whilst retaining the flexibility for solos. Hybrid packs usually comprise of thicker low strings and lighter higher strings. You essentially get the best of both worlds – a meatier tone for riffing with the bonus fretting ease on the thinner, upper strings. Hybrid strings don’t really suit any genre of music, in particular, but are a popular choice for many guitarists who need the versatility. You’ll find thicker strings help maintain tension when you tune down from standard, or for extended range guitars. Thin gauges become very floppy and harm your tone’s crispness, as well as make it more difficult to play. That’s why these are the pick for metal and more old school tones. Very thick gauge strings (with the thickest string being 48 and heavier) tend to suit tunings from drop C and beyond. Acoustic guitarists generally favour thicker strings as they provide more volume, warmth and resonance – key requirements for an acoustic instrument. It’s also less popular to bend strings, therefore sacrifice flexibility for tension. 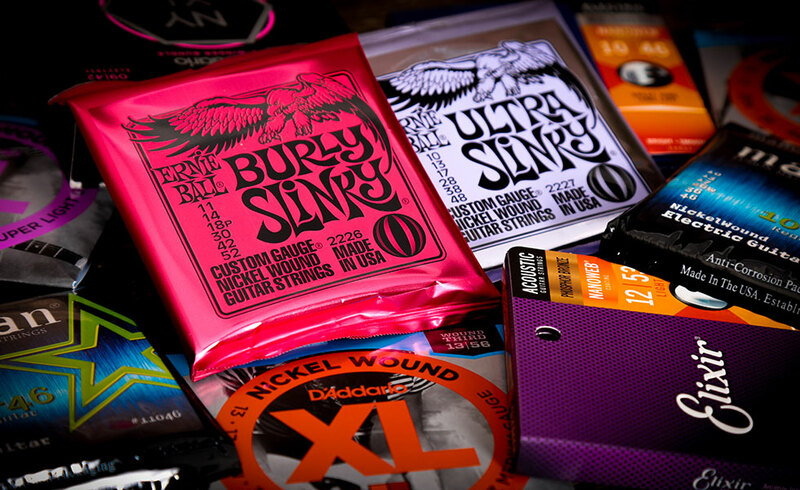 The biggest name in the guitar string industry is easily Ernie Ball. They standardised string gauges with their all-purpose nickel-wound Slinky string packs. They also make a variety of hybrid sets to bridge the gaps between the main packs in the range. This is to cater for some players that like the tightness of the low strings but want to relieve the tension on the high strings, and vice versa. These include a 9-46 Hybrid Slinky, 10-48 Ultra Slinky, 10-52 Skinny Top, Heavy Bottom and 11-52 Burly Slinky. Other popular brands include D’Addario, Elixir, Rotosound, Fender, Dunlop and newcomers Curt Mangan. Each company has a different take on string gauge combinations. It’s down to you to test them out and work out your favourites. After all, string gauge is 90% preference. A good starting place is to find out what your favourite guitarists use, or what musicians use in the genre you play. Follow the general guidelines outlined and you can’t go far wrong. From here, it’s time to experiment. Every player has a natural preference in tone and, most important of all, feel. Don’t be afraid to switch brands, as one company might have a couple of strings with different gauges in similar packs you prefer. 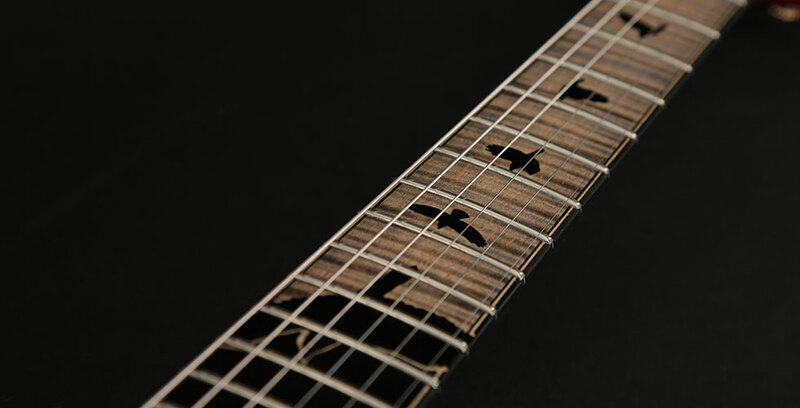 They might also make their strings out of materials like steel, cobalt and titanium, which further expand the tonal and texture possibilities. You can find out more info about string material in our ultimate Andertons guide. If you enjoyed this read, check out more of our Learn articles!